MJM employs experienced professional painters that are available for any task inside or out. Call us for competitive rates, rapid completion times, and zero over-painting. All jobs are completed on-time and usually under-budjet. Free quotes, 2 year written guarantees and reasonalbe rates are what we pride ourselve on. We employ high-pressure power washers for tough-to-eliminate dirt grime. Call us for a competitive quote on larger power-washing jobs. Unwanted artwork on your business or home? 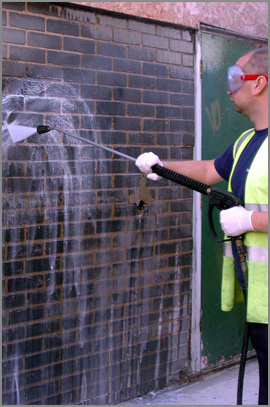 Call us for a competitive quote on grafitti removal. The city has passed a recent ordinance that all graffiti be removed from exterior premises in under 30 days, don't delay have MJM take care of it for you in a timely manner.